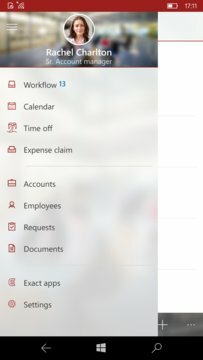 Published by Exact Group B.V.
Take your workflow, schedule, contacts and colleagues with you, wherever you go. 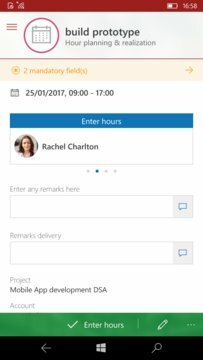 Search, call or e-mail contacts and colleagues directly from Exact Synergy for Windows 10. Enter expense claims or book your time from any location. Exact Synergy for Windows 10 is free for all users of Exact Synergy Enterprise and runs on all Windows 10 devices, including desktop. - Access to your workflow. - Manage your own schedule and view schedules of colleagues. - View, process, create or edit requests. - Access client information and communications. Directly call or email them or plan your route. - Access basic colleague information and directly call or email them or check their agenda's. - Book your expense claim by making a picture of your receipt. The expenses can be booked on a project or account. - Easily confirm and enter billable time which will directly enter the billing process. - Apply for your vacation. - Exact Synergy Enterprise (as of Product update 252). Want to learn more about Exact’s ERP solution for SMEs or have any questions or comments? Please visit www.exact.com for more information.